You can use UIFontWDCustomLoader category to load any compatible font into your iOS projects at runtime without messing with plist, font unknown names or strange magic. The only things you'll have to know are your font filenames and this library name. 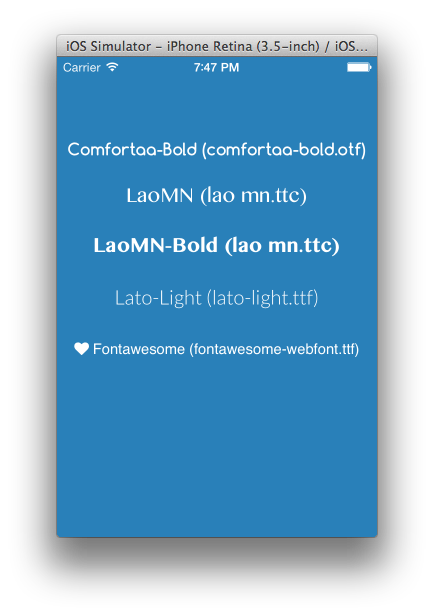 You can also use this library to load new fonts after app installation. Drag'n drop your font into Xcode project, selecting "Add to Targets" when prompted. Check "Target Membership" of your added font files (File inspector on the right). If you can't see a font, check under Build Phases > Copy Bundle Resource: you must see the font filename listed here. // and collection will be registered. NOTE: Font registration will be made on first [ UIFont customFont… ] method call. Simply download it from here and include it in your project manually. in your root folder of your repository.